Take a Christmas card from last year or leftovers from this year. On each end cut a two inch long cut 1 inch in from either side (4 cuts in all). Make a fold two inches in from the end on either end, then another two folds 1 inch wide on the sides. Fold in the end flaps, then fold up the remaining piece, fold over the flaps you've folded in and crease over the top. Tape inside. Repeat on other end. Then repeat instructions for the bottom, making it a wee bit smaller for a good fit. The picture on the card makes a cute front of the box and inside the box bottom is the greeting if all works well. 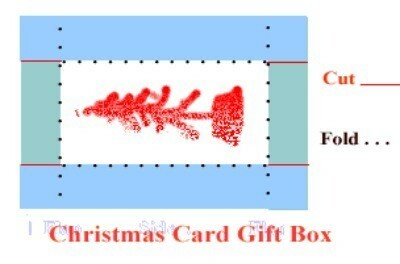 Because Christmas cards are different sizes and shapes, so will be your boxes. They are small but perfect for little gifts or for decorating. They can be used year after year. These work well for any greeting cards. That looks simple. Thanks - am just going to try it! This works very well - lots of other, more complicated templates out there but this is quick and easy. Thanks!